YOU CAN HELP by sending money and relief goods to the organization of your choice. The most urgent needs are: tents, food, clean water, medicine. PIA is transporting relief goods free of cost to Pakistan, but when sending in-kind donations please coordinate the donation beforehand, and ensure you have a reliable point person to receive it, or the material risks being held up in customs or for lack of payment of various duties and taxes, points out Dr Geet Chainani who runs Lifebridge in the flood hit areas of Dadu and Thatta. She notes that because these services are new, there are processes involved that not everyone is aware of. Donors need to ensure that the recipients of their relief goods in Pakistan won’t end up paying duties and taxes, or arranging transport, which drains their already stretched financial and manpower resources. “It doesn’t help when someone tells me there’s a truckload of water bottles to be collected from Karachi,” she says. “I need that water but to arrange the transport from Karachi to Dadu is costly. It’s better to send money so we can buy the water, or medicines, in areas close to us – or get someone to take care of it”. INDUS RESOURCE CENTRE, working in Khairpur and Mirpurkhas, run by educationist Sadiqa Salahuddin – see her email update of Sept 16 posted to this blog which also identifies the main needs and issues in those areas – most urgent need is for dry food. Basic essentials for ten days for a family of six cost around Rs 3,000 a pack. YOUNG DOCTORS’ ASSOCIATION: Dr Faraz Choudhry (twitter@iDrFaraz), General Secretary of Young Doctors Association, RahimYarKhan Punjab chapter is working with medical teams in Mirpurkhas – YDA has been announced as official coordinator of flood and disaster in south Punjab and Sindh. As of Sept 18, the YDA team had treated over 7,500 patients in about 30 different villages and camps in the Mirpurkhas area. 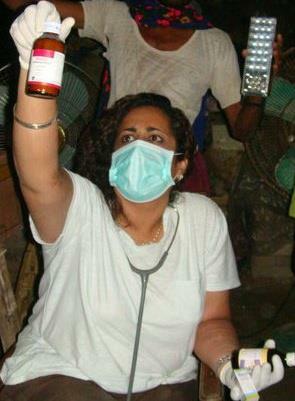 Urgent needs: medicines. 49 Old Clifton, Karachi. Phones 00 92 21 35834663/4 Fax: 00 92 21 35837201. Anis Memon will give you a receipt. Tariq Sheikh can be contacted for coordination queries or supply needs. SOUTHASIA RELIEF: SA Relief, started by US-based activist A.R. Rafique, has been working on several relief efforts since 2005 and has a strong local contact base. When the floods struck last year, SA Relief partnered with Offroad Pakistan (Dr Awab Alvi and Faisal Kapadia) to start PkRelief, collecting and distributing relief valuing well over 170,000 USD for flood relief efforts. The SA Relief blog is constantly updated – see Flood Relief 2011 – Mission: Badin, includes online donation details. Currently they have adopted 3 camps in Badin, Sindh with the support of Nishat Welfare Organization, where 1,000 IDPs are housed. They plan to provide the IDPs with cooked meals for at least the next 15 days. There are many other organisations working in the field. For a comprehensive list, see details compiled last year by Superstars for flood relief. There are also links at the page Flood Relief Info, on this blog.